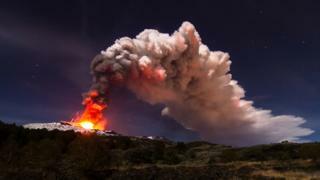 Europe's most active volcano, Mount Etna, is sliding towards the sea. Scientists have established that the whole structure on the Italian island of Sicily is edging in the direction of the Mediterranean at a rate of 14mm per year. The UK-led team says the situation will need careful monitoring because it may lead to increased hazards at Etna in the future. The group has published its findings in the Bulletin of Volcanology. "I would say there is currently no cause for alarm, but it is something we need to keep an eye on, especially to see if there is an acceleration in this motion," lead author Dr John Murray told BBC News. The Open University geologist has spent almost half a century studying Europe's premier volcano. In that time, he has placed a network of high-precision GPS stations around the mountain to monitor its behaviour. This instrumentation is sensitive to millimetric changes in the shape of the volcanic cone; and with 11 years of data it is now obvious, he says, that the mountain is moving in an east-south-east direction, on a general track towards the coastal town of Giarre, which is about 15km away. Dr Murray's team has conducted lab experiments to illustrate how this works. The group believes it is the first time that basement sliding of an entire active volcano has been directly observed. Dr Murray and colleagues stress such behaviour is very rare and can take many centuries, even thousands of years, to develop to a critical stage. Of more immediate concern is the confounding effect this sliding could have for the day-to-day assessment of the volcano.